Chop Chinese cabbage into fine ribbons and set aside. Mince shallots and garlic. Heat oil in a pan over medium heat and sauté shallots and garlic for approx. 2 min., then deglaze pan with mirin, add soy sauce, and cook for approx. 2 min., until liquid has reduced. Transfer to a bowl and leave to cool for a few min., then mix with mayonnaise. Mix Chinese cabbage with lemon juice and sesame oil. Add sugar and salt to taste and set aside. Season chicken breasts with salt and pepper. Whisk eggs in a bowl and add flour and breadcrumbs to two separate bowls. Dredge the chicken breasts first in flour, then egg, and then breadcrumbs. Add oil to a pan set over medium heat and fry chicken on each side for approx. 3 min., until brown and crispy. 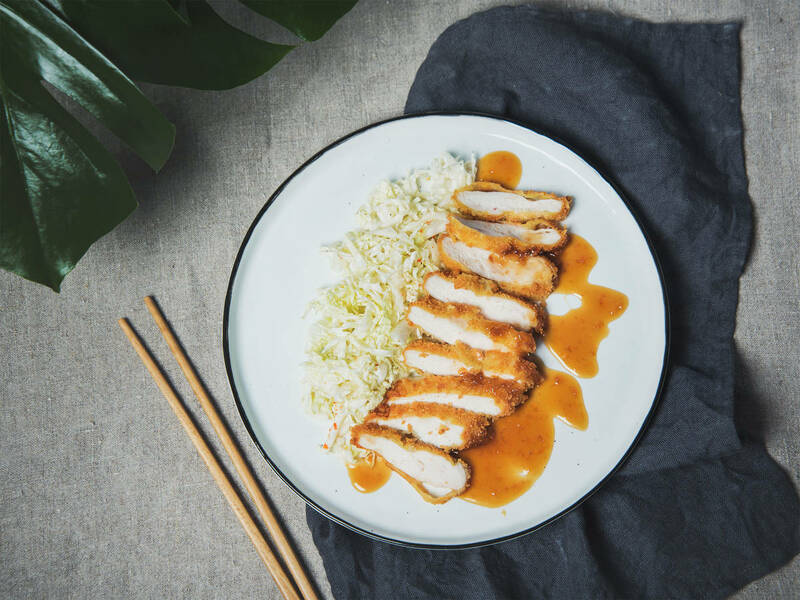 Serve chicken katsu with Chinese cabbage salad and rice and drizzled with mayonnaise sauce. Enjoy!